RSS, also known as Rich Site Summary or Really Simple Syndication, is a web feed format that publishes frequently updated information from external websites such as blogs, news headlines, audio, and video. 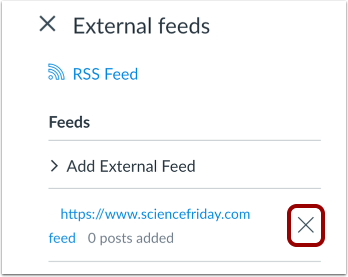 RSS feeds benefit users who want to receive timely updates from favorite websites or to aggregate data from many sites. You can add an external RSS feed in a group announcement. The RSS feed will display the 15 most recent posts within Announcements. 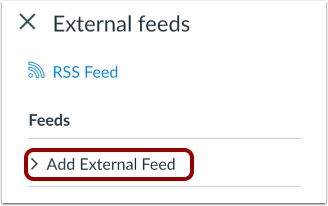 Please note that the feed will only display content created after you added the RSS feed. Moreover, the RSS feed only displays active announcements. Delayed announcements do not display until they are posted. Note: Adding an RSS feed will create an announcement for every new item added to that feed. Users that have chosen to be notified of new announcements in their Canvas notification preferences may see a substantial increase in the amount of notifications they receive. Click the External Feeds link. Click the Add External Feed link. 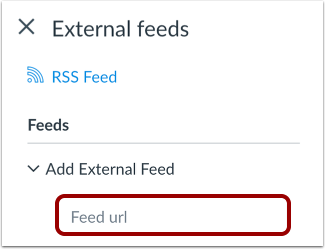 In the Feed URL field, paste the feed URL. All new entries from that RSS feed will be added to Announcements. 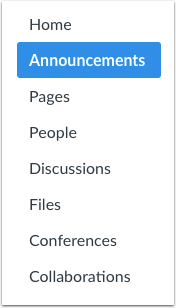 You can select the content that users can view in Announcements. To view the entire article, click the Full article option . To view a shortened version of the article, click the Truncated option . To view a link to the selected article, click the Link option . You can also choose to add only posts with a specific phrase in the title. 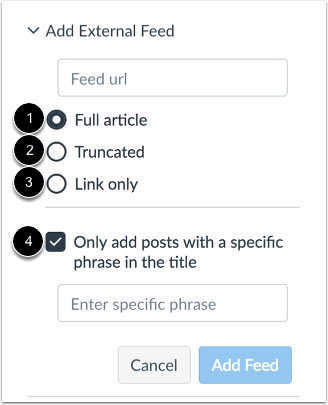 Click the Only add posts with a specific phrase in the title checkbox , and type key words or phrases in the text box. Click the Add Feed button. View the external feed in the feed list. If you want to delete the external feed, click the Remove icon. Note: You will have to wait until a new post is published in the external RSS feed before you can see it in the Announcement feed. Previous Topic:How do I delete an announcement in a group? Next Topic:How do I subscribe to the Announcements RSS feed as a student? Table of Contents > Announcements > How do I add an external RSS feed to an announcement as a student?